The TEM can be used to visualise the complexity of cells and show cellular structures. As the TEM provides a much higher resolution than conventional light microscopes, it can identify small organelles and determine the structural difference and/or changes in tissues under various conditions. Figure 1. 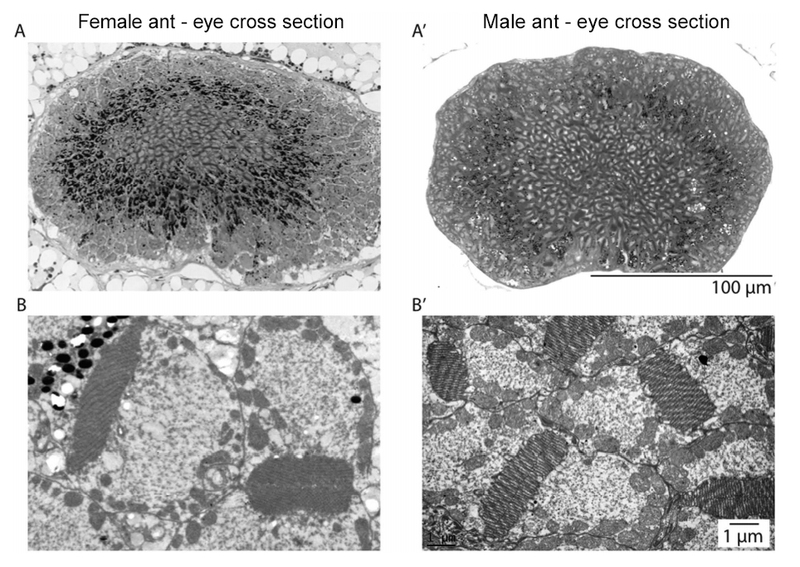 Cross-sections of the median ocellus of the alate female and male ants of Camponotus consobrinus. (A,A') Light micrographs of cross sections of the median ocellus, (B,B') transmission electron micrographs of the cross section of ocellar rhabdoms. Narendra A., Ramirez-Esquivel F. and Ribi, WA. Compound eye and ocellar structure for walking and flying modes of locomotion in the Australian ant, Camponotus consobrinus. The Hitachi 7100 TEM can be used to detect small viral particles by using negative staining techniques. 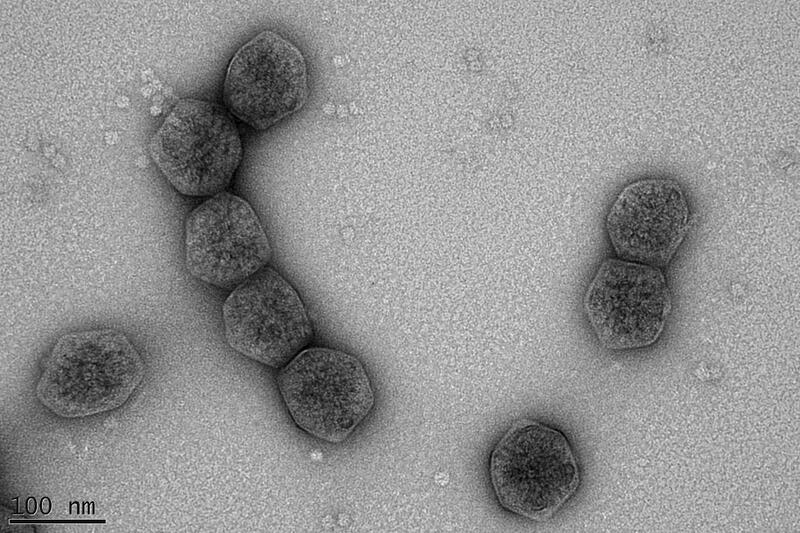 The negative staining technique is a fast and easy way to see fine structures of viruses, bacteria and protein aggregates. Traditionally for observation in the TEM, cells are fixed with toxic chemicals, which can lead to severe artefacts in certain specimens. Cryo-fixation of the sample by plunge freezing preserves subcellular structures like liposomes and cell organelles in cultured cell as close to live as possible. CryoTEM provides images of thin vitrified specimens. The specimen remains chemically unmodified, providing a 'true representation' of the suspended material. 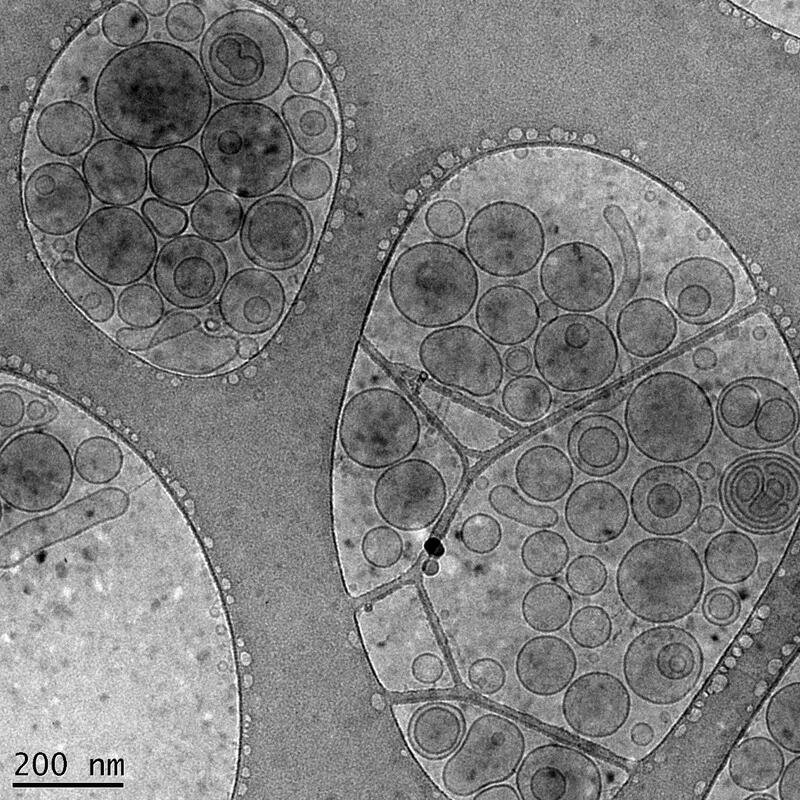 The Hitachi 7100 TEM was used to check the average size and shape of the liposomes in the image below.